Interview with EduSports founder, Saumil Majumdar: "Our main aim is to get children to play"
If we look back to our school days, the entire focus of the school and parents was to make us study more and more with a disregard for any kind of physical activities. The games period or the P.T though was a relief, but the lack of structure and focus in the physical activities made that period boring and a pure waste of time. Well, finally the kids can breathe a sigh of relief as EduSports is on its way to change the way sports is played and taught at the school level. EduSports is India’s biggest and foremost initiative in bringing structure to the sports education scene of India. It does not come as a surprise that the founder and CEO of EduSports, Mr. Saumil is himself an avid sports lover. Very few have forayed in these unchartered waters, but as they say success follows them who take the less beaten path. The same is true for EduSports. Sportskeeda caught up with Saumil for a couple of queries, the answers are must read for any sports lover in the country and more so for the would-be entrepreneurs in the sports education sector. What was your motivation in starting this offbeat venture? The EduSports journey started from a very casual remark from a friend of mine that his six-year-old son was not engaging in enough physical activity was getting hooked to TV & computer. The parent observed that there were hardly any healthy, social avenues for his son to mingle with children outside of the school. Clearly, parents wanted children to play and stay fit and healthy, but there were not enough opportunities for children to have a fun experience around sports. After trying various ideas on a direct B2C model, I realised that schools might be the right partners for helping children experience the magic of sports. Our main aim is to get children to play. EduSports focuses on building a sustainable & scalable model for getting children to play by helping schools deliver sports as an integral part of every child’s education. EduSports uses structured physical activity & sports as a pedagogical tool for developing mental skills, behavioural skills and physical conditioning in children with periodic assessments. 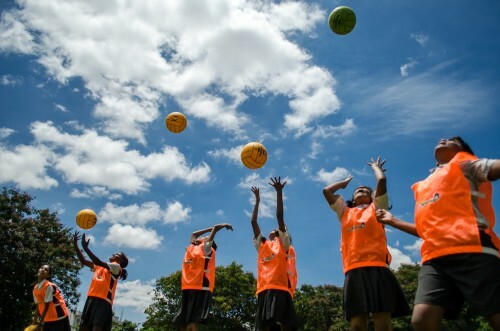 How is Edusports programme different from the traditional P.T programme of the school? Schools are trying to provide a holistic education to schools. We are helping schools to do the same through the magic of sports. Sports have always been an integral part of education. The delivery of the in-school P.T or sports programme, in most schools, has not been inclusive, age-appropriate and has therefore not engaged all kids. If you help children learn the right skills & the right fitness at the right age, they will enjoy the experience of playing sports. And they will, therefore, seek out more opportunities to play. In the absence of learning the right skills and right fitness, only the naturally talented kids enjoy the playing experience. The rest have fun playing video games. Age-appropriateness (of the activity & equipment). Adequate equipment for all children to stay engaged. Inclusion i.e. all children get to play. Not only the talented ones. Assessment. Each child gets assessed and fitness/skill parameters tracked. Designed for limited space & time. Our program fits into the school’s constraints of limited space & time. Parent engagement - Ensuring parents participate in the process of building healthier & fitter children. If you consider the goal of Education to develop a child into a well-rounded adult who can productively work with others in society, sports education is a critical goal. Through sports education, the child learns key life skills like teamwork, discipline, hard work and most importantly dealing with failure which are critical for success – in adult life as well as in handling the pressures of growing up. Apart from that, there is the most fundamental challenge of health and fitness. Without sports education in schools, where do our children play? How do we develop a generation of healthy and fit children if we don’t teach all of them the right skills & the right fitness at the right age, sports education is not only about sports, sports education is education. How difficult was it to convince school principals and teachers to adopt the Edusports programme in their schools? When we started, we did not have any of the tools (curriculum, assessment, monitoring etc). We only had the desire to get children to play in schools. Some of the early schools trusted our sincerity and decided to give us a chance – but also challenged us on how we are going to actually execute the program throughout the year. In partnership with the schools and with a sharp focus on ensuring that the on-ground program delivery is world-class, we kept iterating and fine tuning the various tools used to deliver the program with accountability & transparency. What is the best feedback Edusports has ever got? Very often, parents tell us about how kids refuse to miss school the day “EduSports class” will be held! The best feedback is the love and affection that kids shower every day on the EduSports team. School leaders have told us that kids are more focused and disciplined after the introduction of EduSports. Some parents have come back and said that their kids have become more energetic and involved, school leaders have seen a significant increase in the participation level of children in sports while kids just love the opportunity to play more. Edusports has now expanded to 100 odd cities and four countries, are you happy with the growth? Yes, considering how difficult it was to break into this segment, we are happy with the growth. I clearly remember the product evolution at the start of the EduSports journey. We had to lay emphasis on the program for the young kids segment and not the middle school segment. The nursery-5th standard age group was better suited to the programme demands of most school leaders since they saw a huge gap in the early childhood years when it came to sports and physical education. At the same time, schools didn’t see enough value is just the content-tech platform model which we had zeroed upon as the core product for EduSports. The wanted us to ensure the delivery of the program as well. This meant recruiting and training of PE teachers, something we had never envisioned. The EduSports programme required at least one qualified and trained resource to be present in every school. Till date, availability of highly-skilled graduates from a sports/PE background is the biggest challenge to scaling-up. After the initial hiccups, when the EduSports programme gathered momentum across the country, it brought with it a different set of challenges; a majority of which were related to scaling the service delivery model in remote locations. The entire operations team had to be prepared to service a tier-2/3 city and we required the skilled manpower to execute the programme on the ground. Thankfully, we had the reporting platform in place, which helped us track the programme delivery in remote places. Today, EduSports is present in more than 100 cities in the country and through its operations, hiring and training teams can help set-up a school with a minimal lead time. EduSports today prides itself on being a clear market leader and has helped define the physical education industry in India. The “Sports Education” industry as this is starting to be called is at a very interesting stage. The early adopter schools have embraced this concept of working with a 3rd party for integrating sports into the education process. In the first five years, the focus was on the novelty factor. I call this the focus on “What?” i.e. the whole notion of having a curriculum for PE/Sports, a structured lesson plan, assessment etc. The early adopter schools – and parents – had a positive experience with this model. Kids, of course, loved it. Now, the mainstream schools are starting to ask “How” i.e. they know the “What?” and invite companies like EduSports to discuss “How?” – How will you implement the program? How will you work with my constraints – of space, time and budget? How will you review the program? How will you ensure quality? And hence the industry is now moving to an era of increased focus on systems, processes and technology that can help scale a service business. And therefore, the team that is behind the startup becomes the single most critical factor in determining the success of the business. We believe that the Sports Education industry will develop into a large outsourcing industry on the lines of the Software services or the BPO industry.The key difference will be that the services are driven by Intellectual Property including Curriculum, Assessment Protocols, Technology Frameworks and Service Quality Tools. Given that the service delivery is distributed (across schools) and hence cannot be centralised, there will be increasing focus on being able to enable the school’s system in delivering a good program. Companies that have the platform (curriculum, training, assessment and monitoring technology) to support this industry demand will succeed. EduSports is the largest in the space of Sports Education with 400+ partner schools, 350,000+ children in over 100 cities and 4 countries. Tell us something about the EACE initiative? EACE – EduSports Academy for Coaching Excellence - is an initiative from EduSports to train teachers and coaches in the schools to deliver a PE programme which is fun and engaging for all the children. The training program is usually a seven-day course where teachers are taken through the EduSports way of conducting a PE class on the ground. Modules covered include curriculum structure, assessments, reporting techniques and tools to help execute a quality PE program on the ground. EACE has helped scale the EduSports programme in remote locations by helping train and empowers school PE resources to run a structured PE program. Edusports has conducted five health surveys across India which were widely quoted in print media. What are the main take away points from these surveys? 40% kids don’t have a healthy BMI. 40% kids don’t have required endurance levels. Girls score better than boys on BMI. Non-metros score higher than metros in terms of BMI levels and fitness parameters. Structured sports programs show encouraging the rise in fitness levels. The lack of health and fitness among such a large number of children yet again proves that physical activity/sports in schools should be viewed as an important part of the curriculum for the overall development of a child. There is a need for greater awareness about the importance of play and there must be more time allotted for the same. In the next year, we hope to see far better results. What role has sports played in your growth as an individual and entrepreneur? I have played multiple sports while growing up and have been passionate about sports early on. During my student days, I was selected as part of the Maharashtra Badminton team & the IIT Bombay Football team but I also played a lot of cricket, basketball along with some volleyball. I also have a Basic Mountaineering Degree from Nehru Institute of Mountaineering (Uttarkashi) – just did the Everest Base Camp Trek (April 2015) & I am a practising Black belt in Karate. I find sports a great source of positive energy and that has definitely helped me stay the course over the last 12 years of trying to build a business in sports. At a professional level, I believe sports is a fantastic, fun medium for learning key life skills and I believe I am a good team player & I am able to work with very different people because of my sports experience. Where do you see Edusports in next five years? EduSports aims to reach 1000 schools and get one million kids to experience the magic of sport in next four years and then some more! Any feedback on sportskeeda.com? We also have an app now. Sportskeeda - Earlier this kind of high-quality content was produced only by renowned publishing houses but at Sportskeeda, I see that youngsters and others alike are contributing in a huge way. The consumption of sports content at Sportskeeda proves that there is a huge following of sports in this country and that sports is a common thread that unites this country. Maybe Sportskeeda can also start a section on sports for kids where they cover various inter-school sports events happening throughout the country. This could help in increasing the participation levels of children in sports.